A floor-standing double-sided display system that keeps all rigid board materials up to 18,5 mm in a firm grip. The panel stands straight and stable after fast and easy installation. Panel Base is also used as the base for Magnetic Frame. 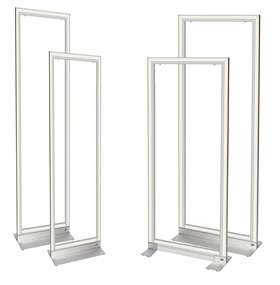 Magnet Frame is a robust system that is quick to assemble and anchor to the Panel Base. Synthetic rubber feet give the system a light floating expression and protects the floor from damage. No drilling required – secured by the foot’s grip, so strong that the whole system can be lifted holding the panel. The natural anodized aluminum surface is insensitive to dust and easy to keep clean. The graphic is mounted securely in just seconds through magnetic force, and a discreet aluminium stripe frames it. It is delivered in a protective cardboard tube.